Dr. Paul completed MD (Internal Medicine) from University of Rajasthan. He did DNB in Cardiology from Escorts Heart Institute, New Delhi. 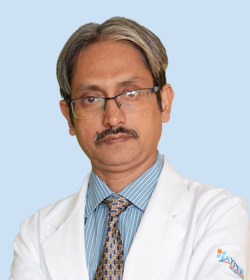 Dr. Paul was coordinator in DNB Cardiology programme in Escorts Heart Institute. He was instrumental in formulating innovative teaching programmes for DNB and PGDCC students. He has published several papers in various national and international journals. He has been awarded by the Indian Academy of Echocardiography. He has been a member of the editorial board of journal of Indian Academy of Echocardiography. Dr. Paul has over a decade of experience in Escorts Heart Institute, Delhi and specialized to perform Echo and Vascular Doppler. He was associated with imaging (Echo) in TAVI and Heart Failure programme (VAD/ Cardiac transplantation). He has special interest in 3D Echo and has worked extensively on the mitral valve. He has performed several 3D reconstructions which have helped in the mitral valve surgery and device closure of ASD.